Grain is a kind of tremolo pedal, but usage is totally different. Tremolo speed is controlled (synchronized) by pitch of the input signal. When you play lower note, speed gets slower, and speed becomes faster when you play higher note. Combining with other overdrive pedals, you will get crazy fuzz-ish sliced sound. Distinct your guitar screaming tone! Grain shines by combining with your favorite overdrive or distortion pedal in front. You will get another way of fuzz like sound not by squaring the wave shape, by splitting the sound. In order to understand how it works, probably it's better to show how signal changes. Here is the input signal. This is one of example. Signal cut every 2 signal cycles. In this figure signal cut completely but you can adjust it anywhere in between. 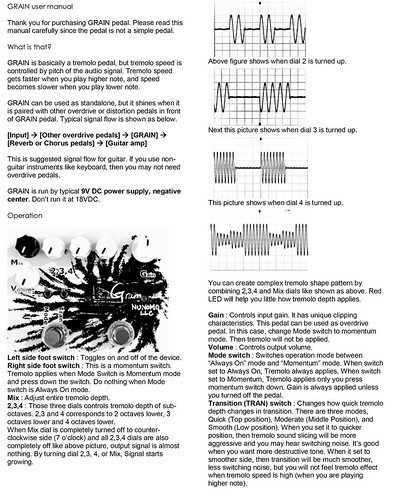 Grain also can be used as simple overdrive. It has its own character when gain is up.